The petition revealed that by day break the next day, Sophie was again at the Adeleke’s home to take her baby but she was prevented by armed police­men from gaining access and again threatened never to return for her child or face dire consequences. The petition further alleged that when Ms Modupe Mofikoya, the im­migration officer, who attended to the Adeleke travelling party, accosted Ash­ley and asked for the mother, Sophie had claimed that she was the mother of the baby after which the immigration officer on duty collected her Nigerian passport and she quickly absconded from the scene with the baby. Her fa­ther, Mr. Deji Adeleke, showed up shortly afterwards to clear his daugh­ter’s mess. An obviously frustrated Davido had taken to social media to vent his feeling and accused Dele Momodu of being the cause of his problems. In his post, he had stated: “I became the father of a love-child. DNA testing determined with maximum proof that I indeed was the father of my daugh­ter, delivered by a head-butting casual lover, Miss Sophia Momodu. I met Sophia when I was barely 21 years old. She was many years older than me and was able to manipulate and exploit my youth, naivety and generosity. Sophia is the mother of my daughter, and no more! She never would be my wife and she was never qualified for that status. Her background is very dissimilar from mine, and she has very paltry education and equally diminished physical attrib­utes. Cunningly, she moved into my house because she claimed she has no place to stay in Lagos and that her father is deceased and her mother is resident in Abuja. I have accepted what providence brought my way including my own per­sonal indiscretions. But I also have been burdened by the lapses in the character of Sophia and have thus suffered for my daughter who I love as much as my late mother, Imade. As for the person of Sophia, I paid a two-year rent for her apartment at Lekki and she receives a monthly allowance of N300, 000 from me ever since Imade was born. In De­cember, Sophia received N500, 000 as allowance and Christmas bonus. 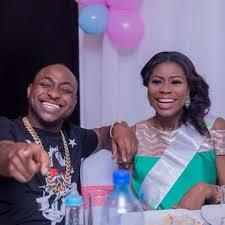 Meanwhile, in a swift reaction en­titled ‘Why I got involved in Davido and Sophie’s ‘babymama’ drama’, Dele Momodu explained his role. His statement read thus in parts: “In September 2015, I got a call from Dr Adedeji Adeleke, a long time family friend, telling me his son had fathered a baby girl with my cousin, Sophia Mo­modu. I rejoiced with him as any rea­sonable soul would do. He apologised that he had not called all along because he wasn’t sure if Sophie’s baby was going to turn out a fake one like that of two others who had turned up at his doorstep. But mercifully, according to Dr Adeleke, Sophie’s baby passed the DNA test by over 98 per cent and he was elated. I congratulated him again as a proud grandfather. “Sophie had narrated to me how on 11th July, 2015, she was tricked to Davido’s sister, Coco Adeleke’s house with her baby, Imade Aurora Adeleke. After getting to the house on Baderinwa Alabi Street, Lekki Phase I, Lagos, her baby was forcefully taken from her and she was thrown out of the premises with the threat that she would be decisively dealt with if she ever bothered to return there. By daybreak on the next day, Sophie was again at Coco Adeleke’s house to take her baby, but she was prevented by armed policemen from gaining access into the house. She was again threat­ened and warned never to return for the child. “Despite the pain and trauma my cousin was made to undergo, I re­strained myself from getting directly involved in the matter and appealed to her to stay calm and take it easy with the Adelekes. But after the phone call from Dr Adeleke, precisely on September 10, 2015, I picked up Sophie and her mum and drove to Dr Adeleke’s home in Le­kki, Lagos. Sophie and her daughter, Imade. Dr Adeleke explained why it took some time to call me and I said I understood. Dr Adeleke said the baby was discov­ered to have traces of marijuana in her during a medical test and said he be­lieved Sophie and David were smok­ers and he needed to protect the child from two irresponsible parents, as he described them. Upon their return, Momodu said all efforts by his wife to prevail on the Adeleke’s failed as they went into the same old story of marijuana abuse and Sophie said she was ready for a test which Dr Adeleke wasn’t interested in. “I flew to Nigeria on December 28, 2015 after Sophie told me the Adelekes were travelling to Dubai with her baby without her consent again. “I then called Uncle Wale Adeeyo again and told him Sophie has plans to stop the trip on the knowledge that Da­vid has collected an American passport for the baby and the rumour that the baby was being abducted to America. I pleaded that we should avoid a confron­tation. I headed for the airport to alert the authorities including Immigration and Emirates. As predicted, the Adelekes arrived the airport with the baby where Immigration had laid in wait for them. Coco came forward and was asked who the mother of the baby was and she claimed ownership and her passport and that of the baby were taken away by Immigration. Her dad was alerted and he came to the office of the comptroller with others to try and rescue the pass­ports but the Immigration stood their grounds. I saw him making frantic calls but he gave up after the flight departed.